We flipped her over yesterday. With the great help of two friends – Jim and Eric, we got the task done in just a few hours. Not even any injuries! There were some challenges – mostly that the tent it’s in is only three feet wider than the boat and only 18 inches higher than the beam of the boat. And the tent frame is too fragile to fasten anything to for lifting. So what we did was to spin it more-or-less in place, using ropes and come-alongs. Here’s a sequence showing the whole process. Saturday morning I raised the stern with a hydraulic jack, set it on sawhorses, and dismantled the strongback. The bow is resting on the stem piece. Then I swept and vacuumed below. I built a sled from a sheet of plywood with steel eyes to hook 2 come-alongs to. Then I slowly lowered the stern to the deck. I jacked up one side of the boat so most of the weight was on the sled. Meanwhile, I ran four lines (2 on each side) from the internal bracing around the boat and through holes punched in the tent walls to solid points on either side. The South side mounted to the house, and the North side went to a canoe rack I’d installed a couple of years ago. I replaced one of the South lines with a webbing-style come-along because I knew that would be the line that needed most of the lifting force. You can see the lines below. Early Sunday afternoon the guys showed up and we jacked the North side up bit by bit until all the weight was on the sled. We took up the slack on the South side lines and removed the supports and the boat stayed up like we hoped it would. More lifting. You can see the temporary diagonal braces bolted to the bulkheads. At this point we couldn’t raise any more because the side of the boat hit the tent poles on the South side. So we slid the bottom corner of the boat North using the come-alongs hooked to the sled. More sliding. We’re approaching the point where she will want to fall to the left instead of the right, so we tightened up the North side lines. I’m testing the line as the others stand wisely out of the way in case she slides or falls. Adjusting the blocks on the sled. She was pretty stable in this position with all four lines tight. As far as I could tell she didn’t flex at all while we did the turning. Once she was fairly stable on her side we moved her over on the sled by rocking her forward and aft until she was in the right spot. Jim and Eric lowered her down by letting out the lines a little, one at a time. Each line went through a pulley to a cleat, so they had pretty good control all the time. Moving the sled over to keep her centered in the tent. Almost down! You can see Jim on the right letting the line out while Eric and I steady. She’s upright! I’ve never had such a complicated series of tasks work so well, with few unforeseen problems. A lot of that is due to the thought and safety-consciousness of the guys helping. After flipping, we had a great meal made by Meryll, drank lots of beer, and sat around for a while. Jim had to leave, so Eric and I spent a while leveling her with jack stands and various blocks. Then we drank some more beer! I rolled on 2 1/2 coats of red Interlux Micron CSC bottom paint using the ‘Rollerfoam’ rollers. It went on well, although pretty thick. The last half coat was as recommended on the can – adding extra protection to the high-wear areas at the stem and keel. I saved about a cup from the gallon for touchups when I launch. I made the waterline about 1 1/4 inches above DWL. I hope it looks OK when the boat is in the water. You don’t need to prime epoxy, but it helps make a really smooth surface. You really, really need to wash the surface – even if your epoxy says it’s no-blush. Adding pigment to the epoxy makes it easier to see how fair the surface is. Alternating epoxy pigments and primer colors makes it easier to see if you’ve sanded through a layer. Wash each layer well, and give the epoxy lots of curing time before topcoating. Learn how to roll & tip paint for a great-looking finish. EasyPoxy, Awlgrip, and Interlux are the most popular paint brands, and all seem to work well. Apply a minimum of two coats of WEST SYSTEM epoxy for an effective moisture barrier. Apply three coats if sanding is to be done. Moisture protection will increase with additional coats, up to six coats or about a 20-mil thickness. Complete all fairing and cloth application before beginning the final coating. Wash the surface with a Scotch-Brite pad and water to remove amine blush. Dry with paper towels. Let the epoxy cure very, very well, wash the surfaces with a 10% solution of ammonia and water, then get it very clean with plain warm water…then sand it…and if the epoxy is completely cured..you should have no paint adherence problems without a primer. Without a good cleaning with water/scotchbright scrubbing or ammonia/water then water scrubbing…you just sand in any blush that might be around on the surface. If a high-build or filling primer is to be applied, 80-100 grit is usually sufficient. After you are satisfied with the texture and fairness of the surface, rinse the surface with fresh water. Rinse water should sheet evenly without beading or fisheyeing. If rinse water beads up (a sign of contamination), wipe the area with solvent and dry with a paper towel, then wet sand again until beading is eliminated. Then shell coat the part with pure epoxy and allowed to dry for 3 days. Don’t skip the 3 day part or you will be sorry. The pigment makes getting a good finish on the epoxy much easier. Tiny bubbles and slight irregularities show far better when there’s some color in the epoxy. And white will show this best. Too much epoxy is not really any better than not enough. With 6oz cloth I have usually found that the second or sometimes third coat rolled on is enough. For the first two coats I used FLAG Resin and slow hardener, then after getting a little smarter, I switched to MAS Low Viscosity Resin and slow hardener for its better self leveling characteristics (all things being relative, the latter was a breeze compared to the FLAG resin applications –don’t do that for barrier coating unless you have a lot of patience and flat surfaces only). After each barrier coat application I sanded by hand, my best sander, with 3M 220 Imperial (stikit – the newer purple stuff). There is nothing in most primers that sticks any better to properly sanded epoxy resin than there is in the paint itself. 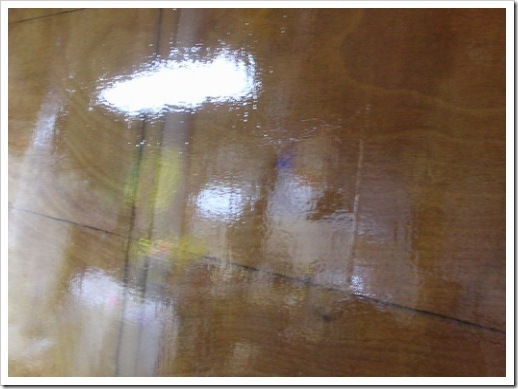 There is a difference between sanding raw laminating epoxy, which doesn’t cut well at all, and sanding primer, particularly a high-build primer which cuts like silk. Drudgery is in the gland of the laborer. Primer doesn’t add anything unless your filling/sanding job isn’t very good and you have a lot of small irregularities to hide. The paint goes on and sticks just as well to properly sanded epoxy as it will to primed epoxy. If you did properly fill and sand the surface, it should be just as smooth in the epoxy state as it would be with multiple coats of sanded primer. You can prime if you really enjoy more sanding and like to watch your sandpaper fill up, but is isn’t going to do anything to improve the paint jobs texture or adhesion. WEST 105/205/barrier coat additive, topcoated with plain 105/205 then sanded to 120 on a random orbit with no primer and Brightside rolled and tipped over it. Work done outside in the summer, no thinner added. I have had good luck with Brightside in years past. I used a foam roller and a very good badger hair brush on fancy jobs. Need to move fast and keep the wet edge. Experiment with thinner to help it flow and keep wet edge. I rolled vertical and brushed horizontal and except for one spot where I lost the wet edge, people thought it was a spray job. Sandable primers, as what was told to me were only to be used for minor surface imperfections and microfairing and were thus sanded semi transparent as to not shrink and move at different rates than their compatible top coats and was in no way to make up for fairing work of the substrate. Pettit’s Easypoxy Primer covered the epoxy very nicely, and sanded out easily. I used to use Interlux, but I now use Petit EasyPoxy. The EasyPoxy is really tough. Two coats of Awlgrip 545, which stinks like hell and probably gave me cancer, but is the best paint I’ve ever worked with. mixes easily, rolls on evenly with great coverage and sands like a dream, especially when compared to sanding epoxy. The industry standard these days is Awlgrip 545 primer. This stuff is works really well, but it ain’t cheap. I used some System 3 epoxy primer on a multihull last year, and I was not happy with the application or the result. The advantage of that epoxy primer is that it has low VOC’s, which is great….but the performance was really lacking, so back to the respirator and the 545…or this new stuff. I have been using Interlux Epoxy Prime Kote 404/414. It is a multi-purpose two-part epoxy primer for use above and below the waterline and it makes a great sanding surfacer. Sprays and brushes very well. Alternate color of primer surfacer to help pick up low spots/scratches. Epoxy primer can be easily tinted with resin colorant. I’ve been using the Interlux 401/404 epoxy primer with good results. It’s a bright white color with a flat-ish finish, so you can use it as a finish coat for some interior applications–lockers, bilge, etc. It’s a lot less expensive than the Awlgrip product. The 404/414 is a good surfacing primer. It sands well. It’s a bit porous, so it takes stains easily. I’ve applied gallons of the stuff with the small foam rollers from home Depot: “rollerfoam “” ultra fine foam for the smoothest finish ” “all paints and coatings “. I’ve always added the maximum thinner recommended; 25% of the 2333N Brushing reducer .This has lain out smoothly for me ,though I carry a foam brush to tip if needed. Answer – Used the “Rollerfoam” that Bill Perkins recommended–worked like a charm. Used one roller cover for the whole bottom and topsides of this 18′ ft. boat. Coat tended to stipple, especially as the 404/414 began to cure–so used a foam brush to tip it off. I think the key is not loading too much paint on the roller pad… apply an even thin coat of paint but not any more than necessary on the roller. This fairly thin layer of paint… when tipped just layes down very smooth and uniform. I found that the badger brush works better because I think the tips of the brush seem to stay more wet than the foam. Brightsides is good too. I prefer Easypoxy and am used to it. When I put the 6 oz glass layer on the boat I followed the standard advice to fill the weave of the cloth the same day. The rule is to add a few more coats of resin on the same day, adding each coat when the previous one was tacky. This is supposed to create a great bond between the layers, without the need to sand or to wash off any amine blush. I did exactly that, rolling on two layers the same day I added the glass. The final coat was complete at about 9 PM that night – a long, difficult day. The boat looked great! The weave was filled. I had dreams of turning the boat over in Mid-July. A few day later I washed the hull and sanded the whole thing with a longboard and a random-orbital sander. While I did that I noticed a few areas with a strange feathered-looking edge where I had sanded the top layer pretty thin. One day I took a putty knife to one of the areas. To my horror, the putty knife slid under the layer and peeled off a long strip of epoxy! I was shocked, but hoped it was just in the one place. It wasn’t. Everywhere I tried, I could do the same. Some places adhered better than others, but most could be peeled off the same way. Some areas had two distinct layers. It took a lot of time to do even one square foot, and I occasionally gouged through the glass layer into the wood. The good news is the glass layer itself seems to be attached well. I spent weeks scraping the hull, from mid-July to early September. It was incredibly depressing, moving backwards instead of turning the hull upright and starting the interior. By September first I was done, and the hull was stripped down to the glass, sanded, and ready to move forward again. I still don’t know what the problem was. When I was adding the fill coats I reused the mixing buckets and the foam roller. Maybe the partially-catalyzed resin contaminated the mix. Maybe I didn’t mix the epoxy enough (although the layers cured fine). Maybe the humidity changed and dampened the hull between coats. I have no idea. I don’t think it was a bad batch of epoxy. I tried some tests with the same 4-gallon container and didn’t see the same problem. Here’s a set of pictures of the stern being sheathed. The round stern is made of two layers of 1/4 inch plywood laminated together. Quarter inch ply is surprisingly uncooperative when bent to such a tight radius. It took a lot of encouragement and a little coersion to make it conform. Trimming to fit. I pre-trimmed the rest of the sheets which made them easier to bend and install. Outer layer. The drips are from holes drilled so you can see if there’s enough epoxy between the layers. I didn’t thicken the laminating epoxy enough and it started dripping out from between the layers along the bottom. Plastic tape and lots of clamps held the glue in place long enough for it to cure. The vertical 2×4 left of center is the clamp bending the ply to the boat while the screws are driven. It’s braced at the bottom and pulled tight with a line running to a cleat screwed onto the bow. This outer layer lays into a 4 inch wide dado in the 1/2 inch hull plywood. This makes the joint more fair and spreads out the forces. The notch was easy work with a power plane. What a great tool! I added this layer on the stern last Saturday. I hope to laminate on the last piece on Thursday. We’re having a ‘morale event’ at work on Thursday – the whole team is going bowling. Laminating plywood is a much better way to raise my morale! Next: Clean up the stern, laminate the 1/4 inch bottom sheathing, sheer clamps. Then glassing the hull, adding the bow pieces and the keel(s) and rub strips. Sand, fair, bottom paint, flip it! I’m still aiming for the turnover around fourth of July – three months from now. Possibly feasable, but a lot of work to get done by then.